Get ready for bumper to bumper traffic in our newest, most extreme Rush HourÂ® adventure! Rush HourÂ® Deluxe Edition is designed for maximum performanceâ€”with 60 of our favorite challenges, including exciting levels of play from Beginner to Grand Master. The flashy new design will help kids race out of gridlock in style, as they shift their fiery red car in overdrive to reach the finish line. 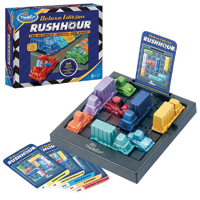 This ultimate game of strategy and fun is guaranteed to delight seasoned Rush HourÂ® fans and newcomers alike. Start your engines and get behind the wheel because weâ€™re revving up the fun. Features: Includes game board, 15 metallic cars and trucks, 1 fiery red escape car, 60 specially selected challenges with solutions and a collectorâ€™s storage box with built-in instructions for easy travel.